This home's complete makeover is a showstopper, a stunner, a superstar -- it will take you awhile to run out of synonyms. The best part of this project? The homeowners used our Norwich Colorado Stacked Stone panels, and beams from our sister site, in almost every single room of the house. See 5 of the rooms below and click here see them all. The master bathroom is a rustic dream with new raised sinks, cabinetry and one wall covered in multi-colored, distressed wood planks. Placing the panels on the wall behind the sinks was a smart choice because they are waterproof and easy to clean (just a little water and wipe with a soft cloth). Next is the living room with gorgeous hardwood floors and furnishings. But the focal point of the room is the fireplace wall covered with our panels in the Toasted Vanilla color. Besides their realistic look, another benefit of the panels is that they are very easy to cut with a regular wood saw, so fitting them along an angled ceiling like this one is a snap. In this photo you can also see the Hand Hewn real wood mantel and ceiling beams ordered from our sister site, FauxWoodBeams.com. 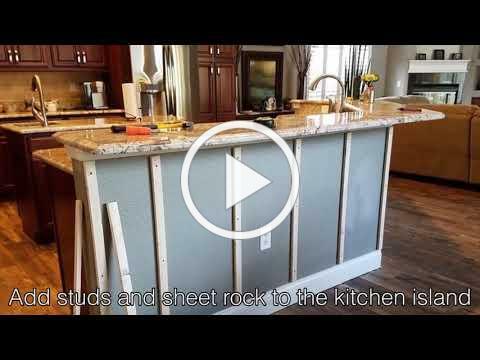 You'll see consistency is key in this home's remodel as we move to the kitchen. But consistency doesn't mean boring in this case. The panels in Toasted Vanilla were artfully added to the bar seating area and wall, but a different material was used for the backsplash to avoid it being too "matchy-matchy". On the ceiling, the homeowners also installed the same Hand Hewn beams used in the living room. This is definitely the "fun room" of the house, outfitted with a slick pool table and cocktail bar in black and chrome. The wall opposite the bar was covered in our stacked stone panels in the Iced Coffee color -- the perfect choice for the coolest hangout in town. A chamber fit for a king or queen, this master bedroom is nothing short of spectacular. Above the dresser sits a sleek fireplace backed by an accent wall created with our panels in the Toasted Vanilla color. This photo also offers a great view of the Tuscany beams from FauxWoodBeams.com, installed on the tray ceiling above the bed.